The Built Environment refers to the human-made surroundings. Early Hawaiians altered the land to a minor degree for agricultural purposes, for village and home sites and the construction of stone heiau for religious practices. People ventured to the upland forests to gather wood, poles and cut trees for canoe building and to tend some small garden plots but settlements were primarily built along the coastline as the ocean provided an abundance of food resources. In the early 1800s modern construction techniques and materials were introduced to the islands and a new built environment began to emerge. Some of the first buildings to be erected were Protestant churches. The Hawaiian Islands were not known to the wider world until the 1778 voyage of discovery by British explorer Captain James Cook. After that time the islands became a convenient stop for merchant sailing ships conducting trade with China. European and American vessels would stop to replenish supplies, make repairs and engage in barter with the native people. The first immigrants to settle in the islands were Protestant missionaries from the U.S. New England states of Connecticut and Massachusetts. Their legacy and influence are still evident today. The first missionaries aboard the brig Thaddeus sailing out of Boston for 163 days arrived in Kailua Bay, Hawai’i April 4 1820. The company included Two Ordained Preachers Hiram Bingham and his wife Sybil and Asa Thurston and his wife Lucy; Two Teachers, Mr. Samuel Whitney and his wife Mercy and Samuel Ruggles and his wife Mary; A Doctor, Thomas Holman and his wife Lucia; A Printer, Elisha Loomis and his wife Maria; A Farmer, Daniel Chamberlain, his wife and five children. Succeeding companies of missionaries continued to arrive through the mid-19th century, heavily influencing change in Hawaiian society as well as advancing developments in education, organization of government and entrepreneurship. The strict Calvinist leaning New Englanders also exhorted the natives to to adopt what they deemed proper clothing of woolen trousers and jackets for men and for women to be covered in a garment from neck to foot, meanwhile shaming their traditional dress, customs, and dance. What followed was a stripping of tradition, land, political power and health from the native Hawaiians. An unforeseen consequence of the missionary salvation effort and immigration was the toll of foreign-borne smallpox and measles, which reduced the native Hawaiian population by a horrific 75 percent between Capt. Cook’s arrival in 1778 and 1853. A debate which began 194 years ago regarding the benefits and benevolence of the New England missionaries vs. the loss of population, culture and Kingdom of Hawai’i continues today. There are no answers or judgement to be found here. 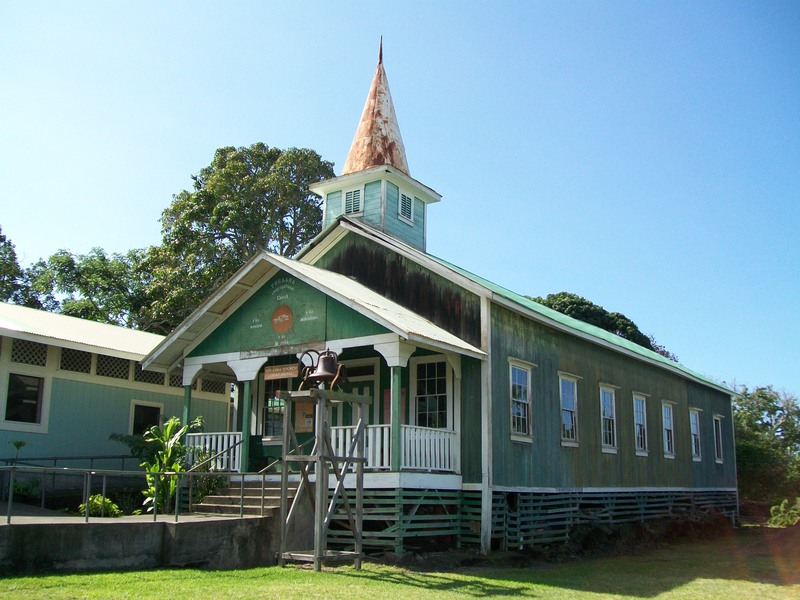 We only offer a glimpse at some of the first modern buildings, the historic church architecture of old Hawai’i. Mokuaikaua Congregational Church est. 1820, Kailua-Kona, Hawai’i. 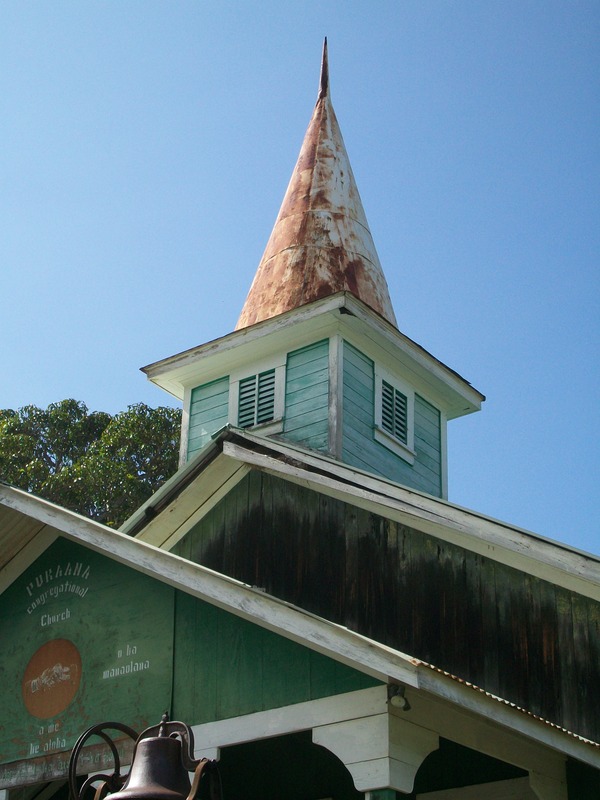 Mokuaikaua Church, with its 112-foot-tall steeple has been a well recognized landmark in Kona for almost 180 years. 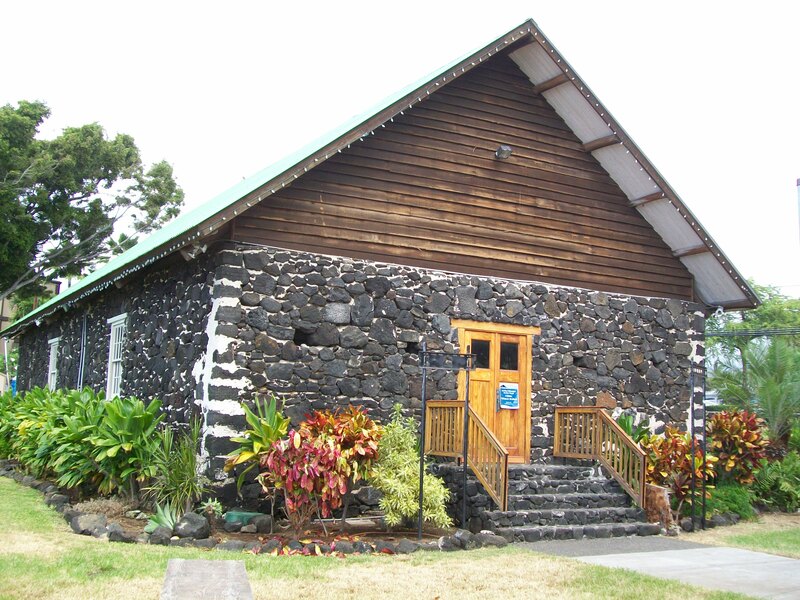 Built of stones taken from a nearby heiau and lime made of burned coral, it represents the new western architecture of early 19th-century Hawaiʻi and became an example that other missionaries would imitate. The 48 by 120 feet lava rock and coral mortared church is the first and one of the largest stone churches in Hawaiʻi, outstanding for its simple, well-proportioned mass and construction. The interior open timber structure with high galleries and pews built of koa wood is a fine architectural and engineering design. The architectural interest is further enhanced by the church’s historical significance and listing on the National Register of Historic Places. The American Protestant missionaries who were sent to Hawaii by the American Board of Commissioners for Foreign Missions first landed in Kailua-Kona, Island of Hawaii, in April 1820. The Rev. Asa Thurston and his wife were assigned to establish the mission in Kailua, then the capital of the Hawaiian Kingdom. They were given permission to teach Christianity to King Kamehameha II, and the Queen Regent Ka’ahumanu while also starting a congregation of converts. When the royal court relocated to Honolulu on the island of Oahu in October 1820 the Rev. Thurston and wife Lucy accompanied them. During the absence of the Thurstons, the Governor of the island of Hawaii, Kuakini, had begun the construction of a house for public worship on the site of the present church. When the Thurstons returned to Kailua in October 1823 they organized the first Mokuaikaua Church which was completed in December 1823. 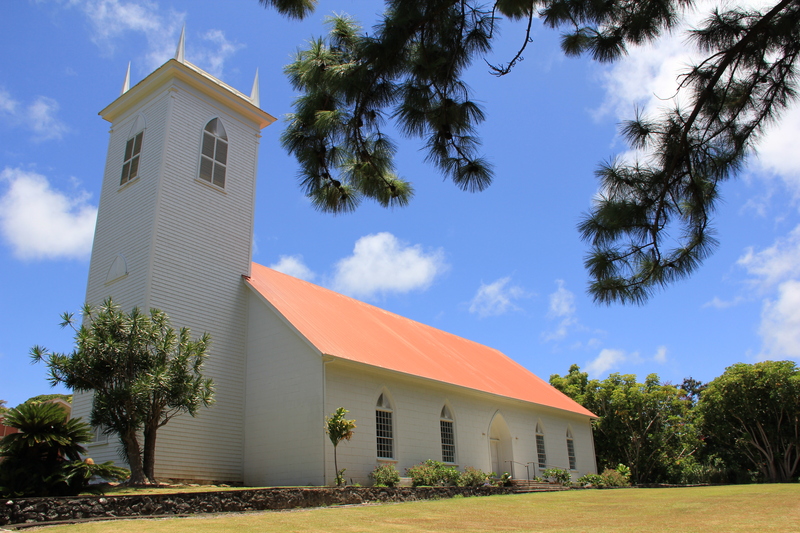 By 1826, the congregation had outgrown the church and the second Mokuaikaua church was constructed. It was built of posts brought down from the mountains by the natives, had a three-foot wall of stone enclosing the posts, thatched sides, and a thatched roof. In 1835, this second church was burned down by an arsonist, and the present church was begun. The cornerstone was laid on January 1, 1836 and as for the previous two constructions Governor Kuakini offered his support and financial assistance to make the building possible. The native church members donated their labor. They brought the ohia timbers down from the mountains (the ten spanning beams are over 50 feet long) hewed them by hand, and joined them together with ohia pins. The church members also had to obtain the coral from the sea, and burn it for lime. Many of the stones used in the construction were reportedly from an ancient heiau which formerly stood near the site. 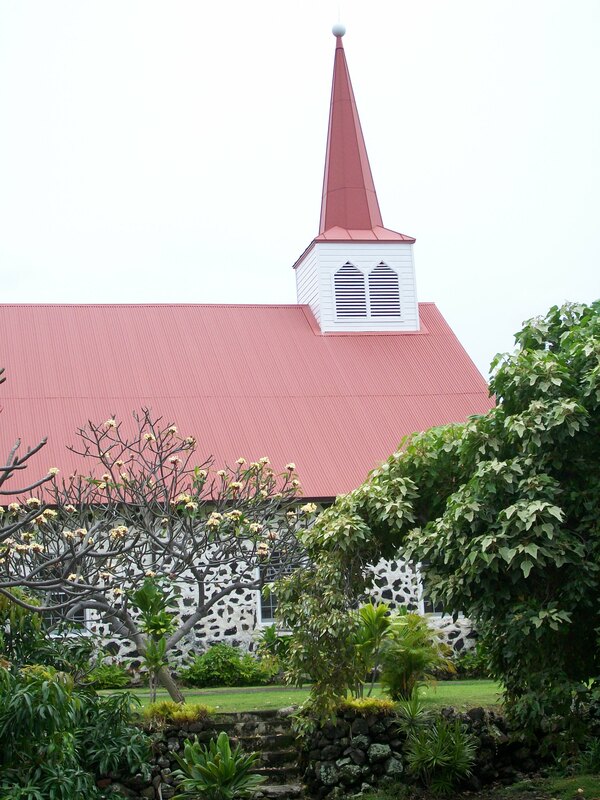 Kahikolu Congregational Church. Nāpoʻopoʻo, Hawai’i. 1824. Overlooking Kealakakua Bay where Captain James Cook first encountered the Hawaiian people sits the Kahikolu Church. Kahikolu means “three in one” in the Hawaiian language which refers both to the Holy Trinity of the Christian faith, but also that it was the third attempt to build a church here. It is the final resting place for Henry ‘Ōpūkaha‘ia (c. 1792–1818) re-interned in 1993 near the place of his birth at the request of his descendants. Archaeologists unearthed ‘Ōpūkaha‘ia’s remains from their 175-year burial site in Cornwall, Connecticut where Henry as a young man had inspired the first New England missionaries to bring Christianity to the Hawaiian people. 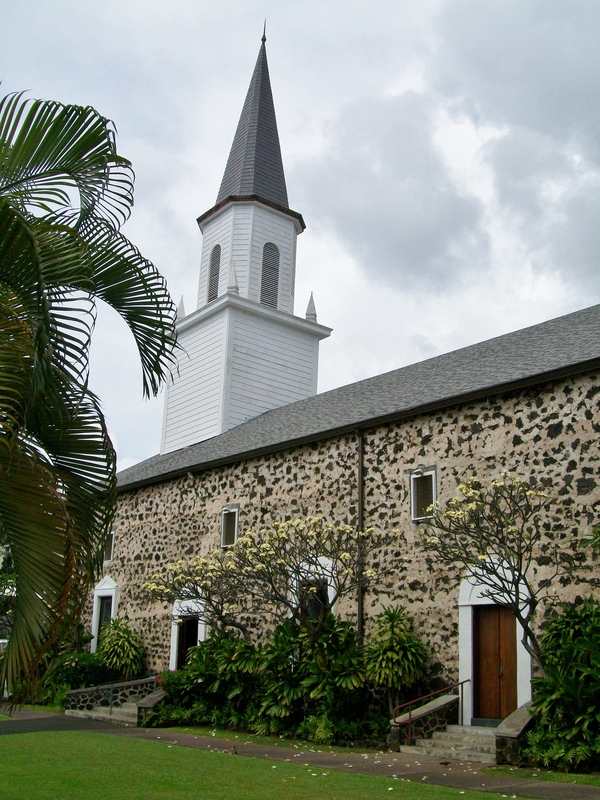 Kahikolu church was added to the National Register of Historic Places on November 15, 1982. In February 1824 High Chiefess Kapi’olani, one of the first Alii (Hawaiian royalty) to embrace the Christian faith, built a thatched house in the village of Kaʻawaloa on the north side of Kealakakua Bay for use as a Christian church. Rev. Asa Thurston, was asked to deliver the dedication sermon, officially establishing the Ka’awaloa Church on March 29, 1824. Rev. James Ely, the resident pastor lived with his family at Ka’awaloa until being replaced by Rev. Samuel Ruggles four years later. Due to ill health Ruggles left in June 1833 when Rev. Cochran Forbes from Hilo assumed missionary responsibility. Forbes soon after built a house and place of worship at a cooler elevation, at a site called Kuapehu (on the ridge of Ka Pali Kapu O Keoua). In 1839, under the direction of Chiefess Kapiʻolani, Forbes moved the mission to the south side of Kealakekua Bay, in an area called Kepulu, just inland from the village now called Nāpoʻopoʻo. In 1840 Forbes, oversaw the building of a grand edifice of stone and adobe block, which measured 120 feet x 57 feet. 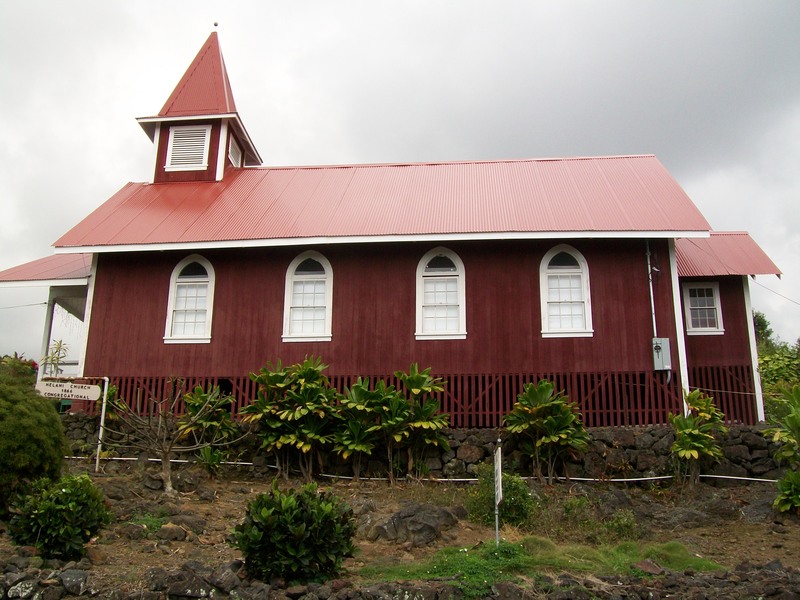 In 1841 the Kealakekua Church was finished, and used until June 1845, when Forbes resigned because of his wife’s ill health. The church had no pastor for the next six years. Reverend John Davis Paris was the next missionary posted to serve the Kealakekua congregation and arrived in 1852. The neglected church lay in ruins. Davis set out to build a smaller church using the width of the massive old church for the length of the new building. Measuring 57 feet by 62 feet with 35 inch thick walls of lava stone and crushed coral mortar, Kahikolu took three years to build. 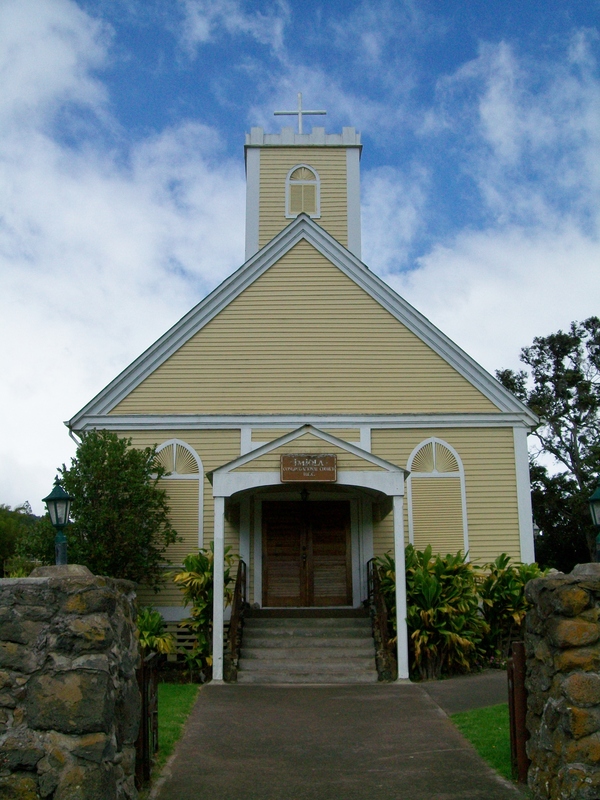 Kahikolu became the third church of the Kealakekua Bay congregation. Rev. Paris went on to build eight more churches, including Hale Halawai O Holualoa. Once the largest church on the west side of the island, its influence faded as population declined or moved to other areas. In 1929, an earthquake caused one of the gable ends to tumble into the church. Moderate repairs were done but repeated damage from earthquakes in 1951, 1952 and 1953 caused first roof collapse and finally abandonment by 1953. Faithful to worshiping God the local congregation began a restoration in the early 1980s receiving state and federal historic designation with restoration mostly completed in 1984. Paris’ building finally stood restored to its magnificent beauty and opened again for use in 1999. Located near the north end of Holualoa Bay, historic artifacts excavated at the church grounds indicate the site has long been used as a gathering place. Under the supervision of Reverend John Paris a coral lime and stone building, of about 30 by 60 feet, was finished by 1855. Hale Halawai O Holualoa means “meeting house near the long slide” in the Hawaiian language. The church was in continuous use until the 1940s. 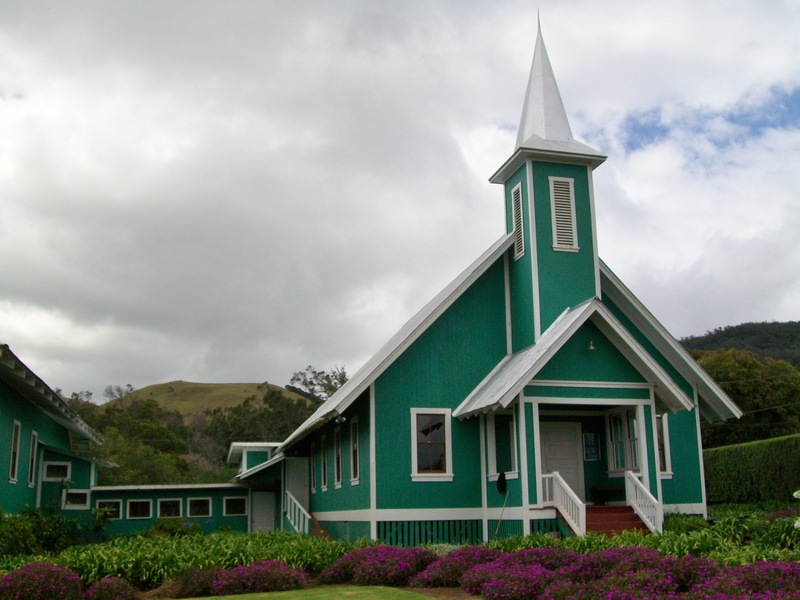 The site was added to the National Register of Historic Places on June 5, 1987 and the Holualoa Bay Congregational Church reconstructed the building in the early 1990s. The old stone church has once again attracted a large congregation that gather on the lawn of this old missionary site at the edge of the ocean. 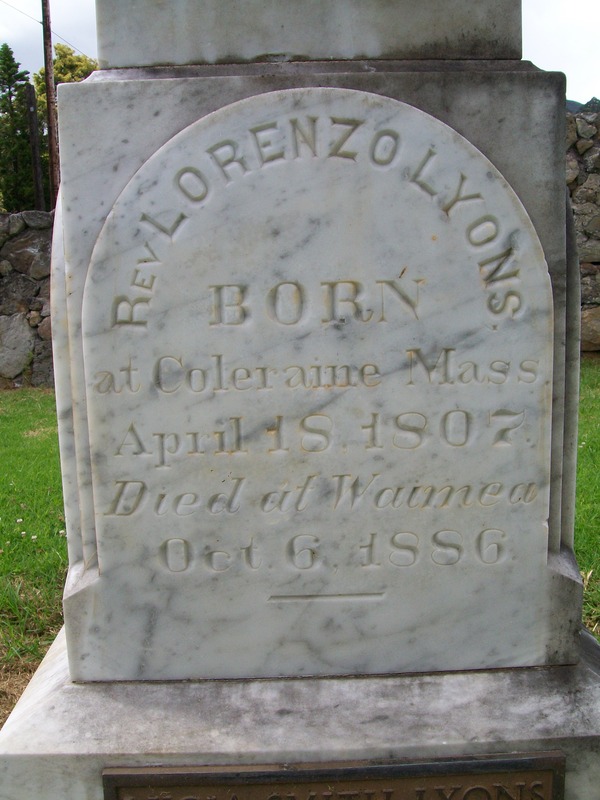 Lorenzo Lyons was born in Colrain, Franklin County, Massachusetts, April 18, 1807. He was ordained as a Congregationalist minister September 20, 1831. Two months later as part of the fifth company from the American Board of Commissioners for Foreign Missions, he departed Boston, Massachusetts aboard the ship Averick with his wife Betsy. After five months under sail they arrived at the island of Hawai’i on May 17, 1832. Lorenzo Lyons spent the remainder of his life dedicated to the native Hawaiians. During his tenure, he was responsible for the erection of fourteen churches, such as Imiola Church where he is buried. The grass hut, the common building method to the native Hawaiian people served as places of worship and instruction when the missionaries first arrived. One such grass hut had been built in Waimaia for visiting preachers some time before 1832. A new church was designed and built by its first pastor, Lorenzo Lyons. Rev. Lyons began construction of a new building of stone walls with a thatched roof in 1837. The membership of the congregation rose to a peak of 5,000 parishioners but by 1841 had dropped to only 1200 souls due to disease and disaster. The ambitious size of the church was scaled back during construction and finally finished by 1843. The structure was never stable and prone to damage from earthquakes. The first building for Christian missionaries in Kohala was a thatched hut in an area called Nunulu, built by Reverend Isaac Bliss, an earlier missionary to Kohala, in 1837. A storm destroyed the hut in 1840. A second thatched structure was built on the present Kalahikiola site, called the ʻIole mission station and and was improved on by Rev. Elias Bond who arrived in 1841. The rough structure was replaced with a wooden framed building in 1846. That building suffered the fate of its’ two predecessors, also being demolished by storm and high winds in 1849. The congregation would take five years to build a sturdier structure entirely handmade from stone and mortar. Kalahikiola Church, was dedicated on October 11, 1855, . The main structure is 40 feet by 80 feet with a 16-foot square wooden tower that was added about 1858. The name comes from ka lā hiki ola meaning roughly “the day of salvation approaches” in the Hawaiian language. Poka’ana Church, Captain Cook, Hawai’i. Architecture has the power to inspire, console, educate and bring people together. Communities can be strengthened or torn apart through their built environments. 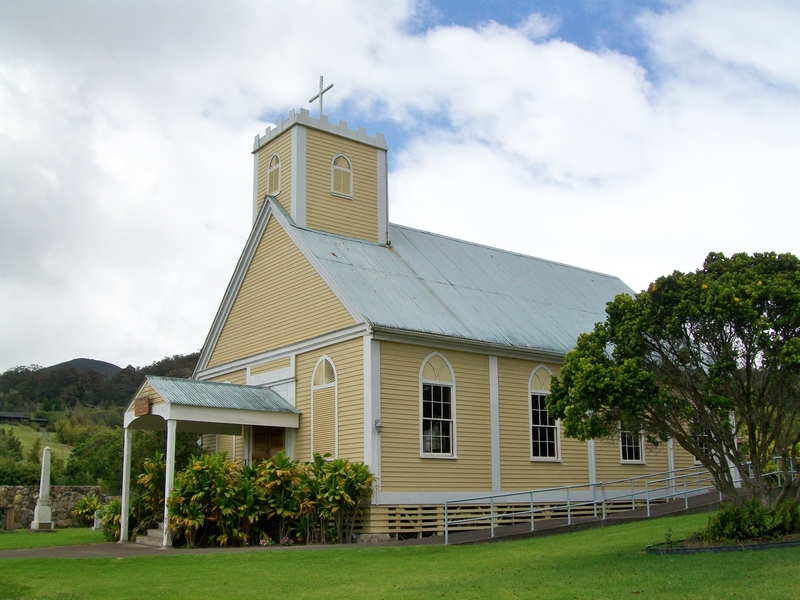 The political, religious and cultural changes wrought by American Protestant influence are manifest in the missionary era’s most important structures, the churches of old Hawai’i. Many of these early structures still stand and are listed on the state or federal list of historic places. They are a reminder of the enthusiasm and energy of the first American missionaries and their Hawaiian converts. This entry was posted in history, the hungry brain and tagged architecture, Hawaii, history, preservation, Society. Bookmark the permalink. Thank you kindly Mr. Eaton. Your feedback is much appreciated. A side note, my grandmother came from a family of Eatons in PA. Thank yo kindly Mr. Eaton. Your feedback is much appreciated. A side note, my grandmother came from a family of Eatons in PA.